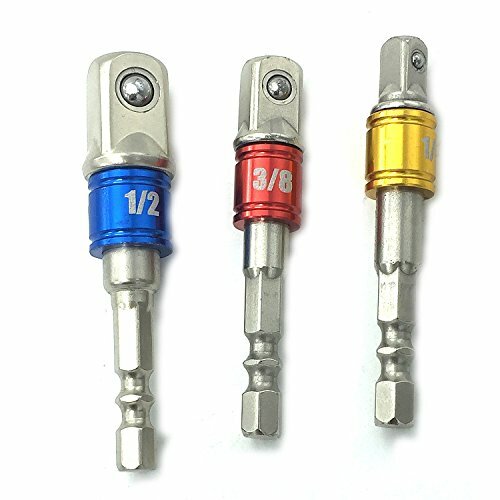 PANOVO (3Pcs)PE-14000 Power Hand Tools Sockets Adapter sets, Hex Square Nuts Driver Drill Impact Socket Extension Bit Adapter Socket Wrench Adapter Set 1/4" 3/8" 1/2" drive. About Us 1.High Performance Product In our store, we guarantee to provide high quality products for you with a good price. 2.Professional Services In our store, if you have any doubts about our products, we will provide you with professional, caring sales service. 3.Efficient Logistics Speed Professional FBA distribution, greatly reducing your waiting time and the risk of packet loss. 4.Product Guarantee To provide you with 1 years of product guarantee, 365 days,throughout the year to provide you with quality product protection. 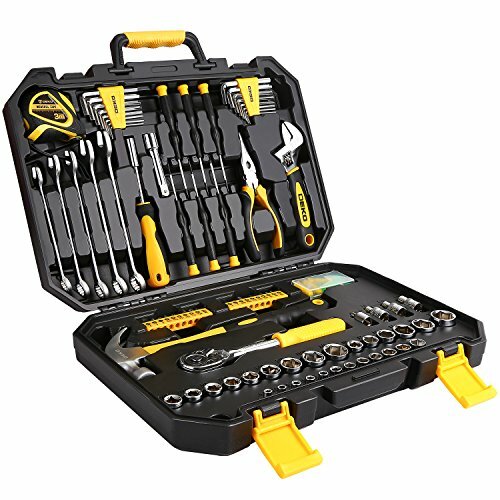 The STANLEY STMT71653 145pc Mechanics Tool Set offers a complete range of SAE and metric-sized sockets and drive tools. 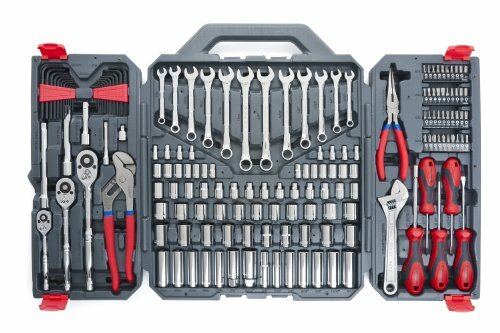 Our socket sets combine the most popular tools for easy accessibility. 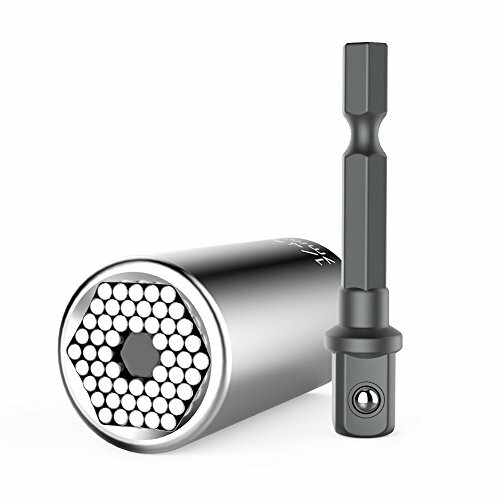 Stanley drive tools are forged from high-quality steel and finished in high-polish nickel chrome or black chrome. 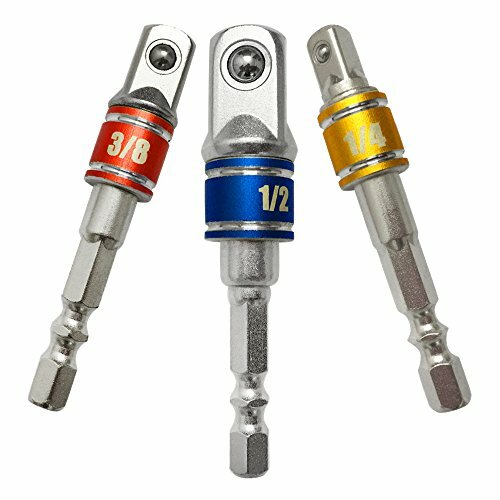 Selected ratchet handles are ergonomically designed and have an easy-to-use, thumb-operated reverse-switch mechanism. Sockets and extensions remain locked onto the drive until disengaged with an easy-to-reach, low-profile quick-release button. 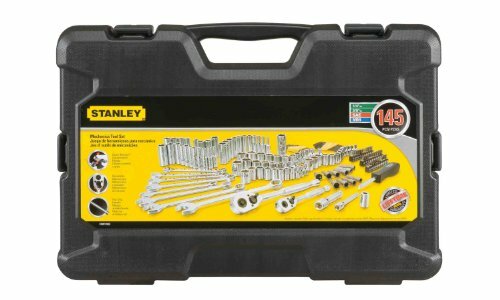 Stanley sockets feature our Max-Drive design, a unique radius corner design that provides 15% more torque* to tighten fasteners easily and simplify the turning of rounded corners. Max-Drive helps reduce fastener wear by minimizing contact on the outer 5% of the fastener, helping to increase life expectancy. 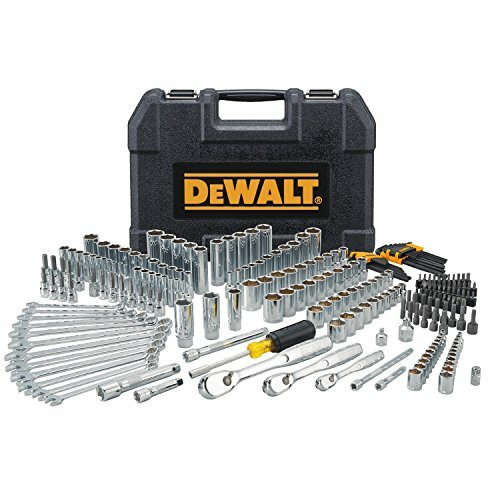 It also helps reduce slipping on frozen or rusted fasteners. 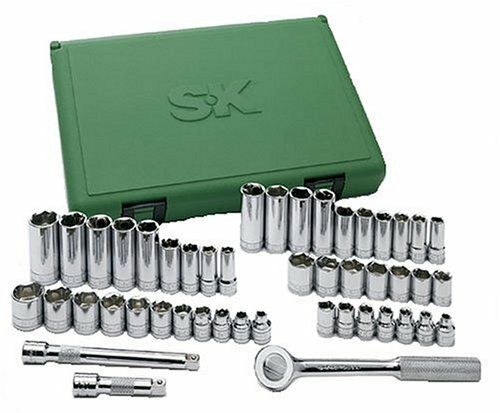 All Stanley ratchets, sockets and wrenches are manufactured globally to Stanley specifications, meeting and often exceeding ANSI specifications. 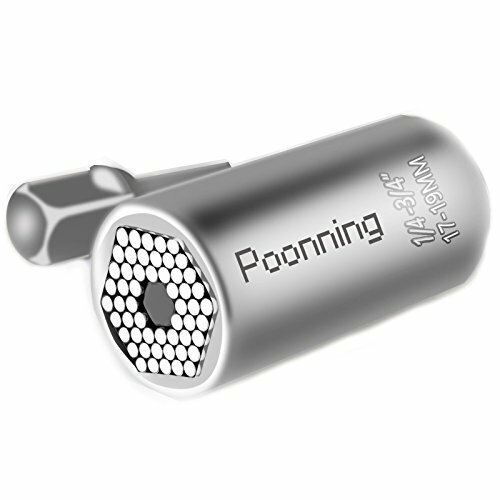 Set includes: 1/4-inch 6-point Drive Sockets MM?4, 4.5, 5, 5.5, 6, 7, 8, 9,10, 11, 12, 13  3/8-inch 6-point Driver Sockets SAE: 5/16, 11/32, 3/8, 7/16, 1/2, 9/16, 5/8, 11/16, 3/4  3/8-inch 6-point Driver Sockets MM:10,12,14,17,19,21  Extension Tore Socket: E8, E10, E12  3/8-inch Drive by 8-Inch Polished Quick Release Ratchet, 72-Tooth Oval Head 11-inch Rip Claw Hammer  1/4-inch Screwdriver Slotted Bit MM: 3, 4, 5, 6, 7  1/4-inch Screwdriver Phillips Bit: #0, #1, #2, #3  1/4-inch Screwdriver Star drive bits: T10, T15, T20, T25, T30  1/4-inch Screwdriver Pozi Bit :PZ1, PZ2  1/4-inch Screwdriver Square bits:S1,S2,S3  1/4-inch hex by 1/4-inch drive socket adapter  1/4-inch Hex Magnetic Bit Holder: 60mm(L)  1/4-inch spinner handle  Wood Screw Assortment Kit  Combination Wrench MM: 10,12,13,14,15  10-Foot Measure Tape Rule  Hex Key Wrenches MM: 1.5, 2, 2.5, 3, 4, 5,5.5, 6  Hex Key Wrenches SAE: 1/4, 7/32, 3/16, 5/32, 1/8, 3/32, 5/64, 1/16  Slotted Precision Screwdriver MM:1.0, 2.0, 3.0  Phillips Precision Screwdriver: #0, #1, #2  6.5-inch Long Nose Plier  7-inch Adjustable Wrench  Socket Adaptor  Storage casePLEASE NOTE:♥When opening the toolbox, place the DEKO logo on it. 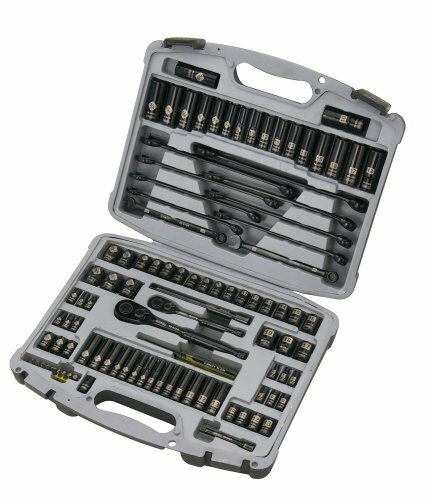 Copyright © Wholesalion.com 2019 - The Best Prices On Hand Tools Socket Set Online.